Hello, welcome to my website! I love playing and collecting Sylvanian Families. They are charming little critters with the most amazing houses and shops, and wonderfully detailed accessories. I enjoy spending some of my time in their world. In here you will see my collections as well as a picture gallery of what life is like in the Sylvanian village. I have a traveling Sylvanian which I named Missbunny, and she goes with me when I travel abroad. You will find Missbunny's adventures in my Mini Blog. I have put together the information in this website mainly for my own reference, based on my best knowledge. It may not be 100% accurate, thus you are most welcome to let me know if any of the information needs to be updated. Thank you for visiting my site. If you have any questions for me, please go to my Mini Blog and leave me a message. 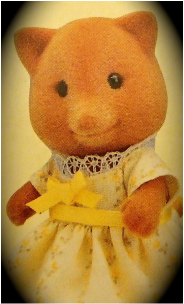 of mysylvanianalbum.weebly.com. This is a fansite for non-commercial use and may not be reproduced or used publicly in any way without written consent from the owner of mysylvanianalbum.weebly.com. All written contents on this website are based on the opinion of its owner or are facts to the best of the owner’s knowledge. All contents, including photos, are Copyright 2011- 2016, mysylvanianalbum.weebly.com. All rights reserved.